From our Japanese Collection, a good set of three large ceremonial lacquer sake shallow bowls in graduated sizes, Showa Period, very handsomely executed with raised gold and black designs of figures set against a red lacquer ground. 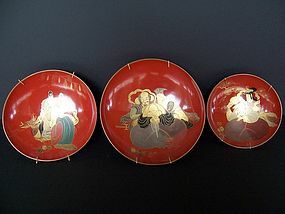 It is quite possible this set is older than we give it credit for, perhaps dating from late Meiji through to the Taisho Period (1912-1926) as several very similar sets for sale on Trocadero are dated, but with these ceremonial lacquer pieces that are totally unused and thus never show their wear, we prefer to be extra conservative and give an outer range date for this set into the mid-Showa Period. In any case, they are very attractive and well-executed and make for a wonderful display. This particular set was apparently hung vertically on a wall with plate hangers by the previous owner. Size and Condition: This is a much larger set than usually seen with diameters of 9 1/4 inches, 8 inches, and 7 inches, and when stacked together they measure 6 inches in height. All are in excellent unused condition but with some pressure marks to the rim edges that appear to have come from the plate hangers.